Eclectic spices and textures and unique dishes define Indian cuisine. And if you’re craving something authentic, Ohio’s excellent Indian restaurants have it. Samosas, tandoori chicken, lamb curry...is your mouth watering yet? Here are the best Indian restaurants in the state! Curry Up Indian Grill strives to give their customers a taste of traditional Indian cuisine with an American twist, and to give them a variety of choices to create a meal for their specific taste. Meals are made from scratch daily, using quality, fresh ingredients, and the restaurant also features a Chai tea bar! The Taj Palace has been serving Hilliard, Columbus, and the central Ohio area sine 1996, providing customers with mouthwatering Indian cuisines and fantastic customer service. Recommendations by the chef include the vegetarian thali, the Maharaja Dinner for Two, or the non-vegetarian thali. If you enjoy spicy Indian food with excellent service and a casual yet comfortable ambiance, the Ambar Indian Restaurant in Cincinnati is the place to go. Each dish is prepared fresh and is flavored with authentic Indian spices. Try a dish of sweet and savory sweet mango chutney or a hot, spicy dish of lamb biryani. For the vegetarians, the vegetable jalfrezi is an absolute must! The best place for Indian food is in Lakewood, Ohio. The food is phenomenal and affordable, and the customer service is outstanding. For those that are beginners when it comes to Indian food, it’s always best to start with a platter style dish, such as the mixed vegetable platter. Another great dish to start with is the traditional tandoori, or the chicken mango curry. The Saffron Indian Grill is classy and elegant, and an atmosphere to match. The menu is bursting with flavor and dishes that are authentic and homemade, and the staff is friendly and knowledgeable, and always ready to suggest something new. Popular dishes include the stuffed samosas, hot and sour soup (vegetarian or chicken) and for drinks, mango juice or nimboo pani, which is homemade style Indian lemonade and oh so good! Amul Indian Restaurant prides itself on providing their guests with authentic, delectable Northern Indian cuisine, and they’ve been serving the central Ohio region since 2003. From dine-in to buffet and a-la-carte style catering, Amul has it. The vegetarian thali is the house favorite, as is the mango milk shake. The Taste of India Restaurant in Lebanon is the neighborhood gathering place for good friends, great service, and amazing Indian food. Start your meal with the aloo tiki, which is mildly spiced deep-fried potato cutlets (because who doesn’t love fried potatoes) and add a scrumptious chicken naan to go with it. And for dessert, the cheesy gulab jamun, which are fried cheese balls soaked in honey syrup, served warm. 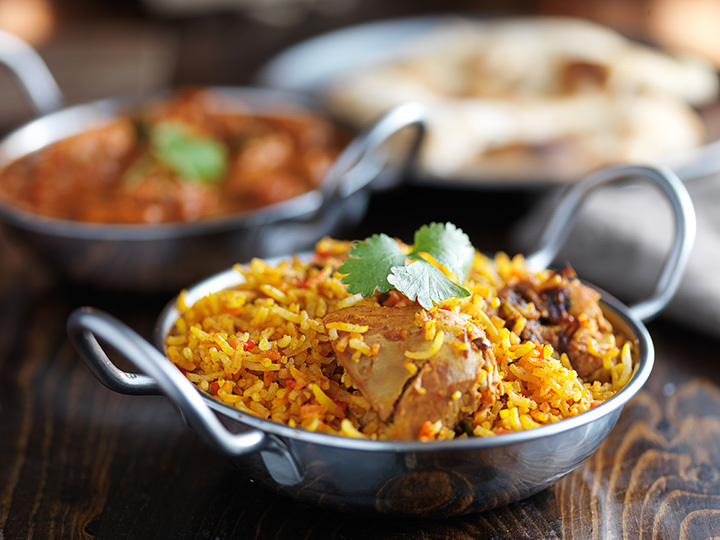 Fresh quality ingredients, excellent service and a friendly staff is what visitors and locals alike will find at the Maharajah of Dayton in Beavercreek, Ohio. What makes Maharajah unique is that it’s the only restaurant to provide the ‘denizens’ of Dayton with authentic, Indian and Pakistani cuisine and hospitality. Popular dishes include the aloo gobhi, fresh cauliflower and potatoes cooked in a variety of spices, and the chicken tandoori, which is marinated in yogurt and spices and baked on skewers. The word “Aahar” means nourishing food, which is what Aahar India in Yellow Springs, Ohio, specializes in. Each dish is a variety of traditional Indian cuisine, from North and South India. They specialize in dishes such as mushroom pakora, cauliflower pakora, and hummus curry. In addition to providing great food in house, they serve mouthwatering food to go and provide catering and birthday specials. Prems Chennai Delight is all about bringing together hospitality and tasty food, two of life’s greatest pleasures, and has been ever since opening day in 2002. Every dish is homemade using the freshest of ingredients, including halal chicken and goat, and have been passed down through generations. Choose from the traditional veggie or non-veggie curry, sweet or chilly naan, or the fried chicken biryani.